There are lots of backup programs available that automatically synchronize and back up all your photos, music and other important files between all your devices. Below are some screenshots of GoodSync to show you where to enter your information to get connected using FTP & SFTP. 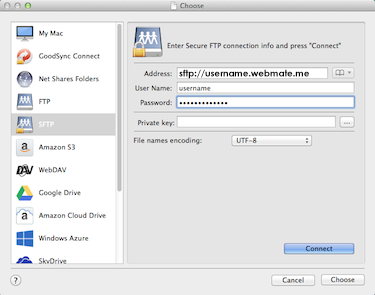 Select SFTP from the list on the left and enter your WebMate user information on the right. When setting up the folders on GoodSync, you can use your WebMate space as the right-hand drive to backup a folder or the whole disk. For folder/disk syncing with lots of files, Select the quick timestamp analysis in order to speed up syncing. 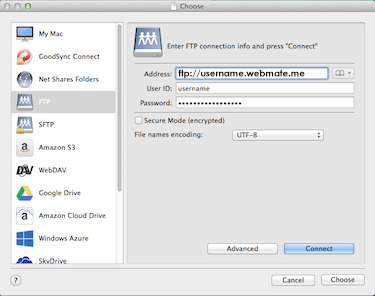 Select FTP from the list on the left and enter your WebMate user information on the right. Copyright © 2019 WebMate. All Rights Reserved.